VietNamNet Bridge - As elephants are now facing a threat of extinction in Vietnam, the country has decided to spend big money on elephant conservation programs. A survey conducted under the framework of the elephant conservation project, Vietnam now only has 60 domesticated and over 100 wild elephants, mostly in the provinces of Dak Lak, Dong Nai and Nghe An. Aware of the threat to the elephant population, the Ministry of Agriculture and Rural Development (MARD) has asked the Prime Minister to issue a prompt action plan to protect elephants. According to Cao Chi Cong from the Forestry General Directorate, ithe elephant population is facing a risk of going extinct. Wild elephants are being hunted for tusks. There are very few male and baby elephants left. In some elephant populations, there is no adult male elephant. In the past, illegal hunters only targeted male elephants for tusks. But now, since elephant skin, foot soles, teeth, bones and meat can be sold for money, they have tried to kill female elephants as well. As elephants are now facing a threat of extinction in Vietnam, the country has decided to spend big money on elephant conservation programs. Meanwhile, the habitat for elephants has become smaller, which has caused biological behavior disorder and affected their reproductive capability. The human-elephant conflict has become increasingly violent because of deforestation. People have been appropriating forestland, leaving smaller land areas for elephants to live. 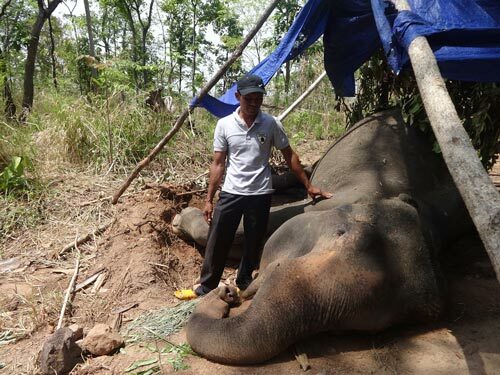 According to the Dak Lak Elephant Conservation Center, in 2016 alone, four wild elephants were killed, while there were 25 cases of human-elephant conflicts. Infrastructure items and tens of hectares of crops were damaged because of the conflicts. There are 44 domesticated elephants now in Dak Lak, including 25 aged 20-40. Though the conservation center has been making every effort to care for elephants’ health and help their natural reproduction, it has failed to protect them. As living conditions have changed, domesticated elephants have lost many of their natural instincts. Meanwhile, many elephants have been reportedly working too hard in the tourism sector, which is beyond the control of state management agencies. An officer of the elephant conservation project commented that there were still many existing problems in preserving elephants in Vietnam, and more drastic measures are needed to protect the animals. Sarah Blaine from Boon Lott Rescue Center in Thailand said the country has prohibited the exploitation of natural forests since 1999 to protect animals. Therefore, elephants can live in a safe environment, while domesticated elephants are taken care of well. Instead of allowing tourists to ride on elephants, Thailand now provides tours in which travelers can watch elephants and learn about their life in the wild. The Dak Lak Elephant Conservation Center complained about the staff deficiency. Under a decision by the provincial authorities, there must be 50 workers there, while there are only 16 now.